Consignor Information: You receive 70% of total amount sold. A $10 fee is deducted from the total sold. All items will be inspected for cleanliness, holes, stains, missing parts, and proper tagging. Remember, clothes that are washed, ironed, and hung neatly on hangers will sell better than items that look wrinkled or sloppy! Clothing is the proper season. Clothing is in good condition. Toys work and batteries are included when necessary. Items are not over our limits. You have a minimum of 30 items to participate in the sale. You do not have more than 300 items. You do not have items on our “What’s Not Acceptable” list. Your tags are on card stock (any weight between 65 lbs and 110 lbs should be fine) or index cards. Clothing is on wire hangers and hung correctly. Time & Date: 10 AM – 1 PM or 3 – 6 PM on Saturday, April 6th. Sort items by size and gender to speed up the process. Label your bins/boxes with your name if you choose to leave them at church. Plan to stay as we go through your items, making sure they are on our “What’s Accepted” list. We will return any “not accepted” items to you during the Check-in process. You will sign in with your name, address, phone number, and email address. Time & Date: 5 – 5:30 PM on Saturday, April 13th. Bring boxes or bins to collect your items. Look at our lost & found table area. At this time, you will receive your envelope with tags of items sold and your check. Ask yourself: would I buy these items at the price I am asking? Keep in mind the age and condition of the item. Clothing size 2T and up must be on wire hangers. This is for protection of the items and space on the racks. If your clothing is on plastic hangers when you check in you will be asked to rehang it all on wire hangers. Clothing sizes 0 to 24 month items can use plastic or wire hangers. Clothing should be attached to the hanger in a secure fashion, with large safety pins. 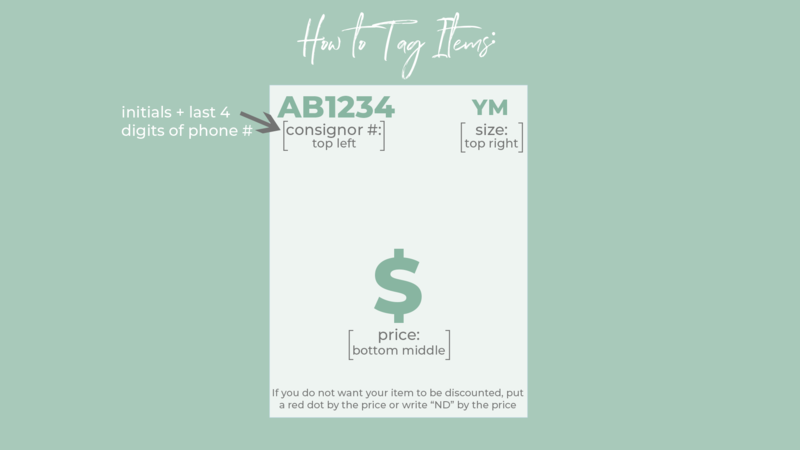 All tags must be printed on white card stock or index cards. No plain paper tags will be accepted. The tag should be pinned with a slivertone safety pin on the left shoulder of the item. (The tag will appear right when you look at it laying flat and face up.) Do not use small gold safety pins or straight pins. If your tags are pinned incorrectly, we will ask you to re-pin them so that they will show properly when hanging on the racks. If the item has multiple pieces, pin them all together so they do not become separated. Many dry cleaners will give you hangers, or you can purchase light-weight wire hangers from Walmart, Dollar General, etc. Clothing seems to sell best when paired with coordinating items and hung as an outfit. Toys with small parts should be placed in a Ziploc bag, with the bag securely taped with clear packing tape. If small parts go with a larger item, please secure the bag to the larger item with packing taping. Shoes should be properly secured together, whether with a zip tie, in a Ziploc bag, etc. It is common for customers to want to try shoes on their children, so please keep this in mind. We find a lot of lost tags from shoes, so please attach as securely as possible. One option is to enforce the corner of the tag with packing tape, hole-punch a hole there, and zip tie the shoes and tag together. Seasonal shoes (limit 8 pairs) in good condition, limit includes athletic shoes. Large toys- playhouses, slides, climbers, etc.